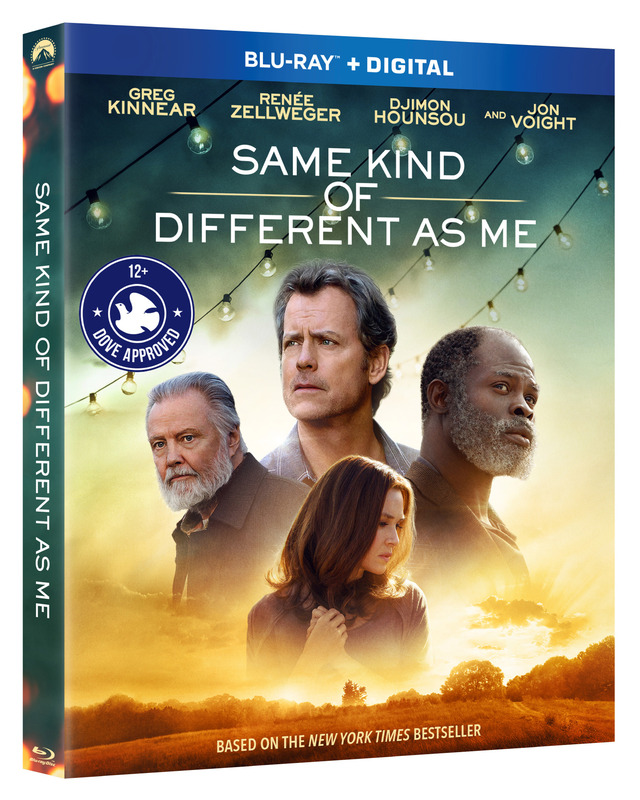 SAME KIND OF DIFFERENT AS ME stars Renée Zellweger, Greg Kinnear, Djimon Hounsou and Jon Voight. Based on The New York Times best-selling book, SAME KIND OF DIFFERENT AS ME follows successful art dealer Ron Hall (Greg Kinnear, Heaven Is For Real) and his wife Debbie (Renée Zellweger, Bridget Jones’s Diary), who seemingly have the perfect life. But when their faith and family are tested, an unlikely bond with a homeless drifter (Djimon Hounsou, Blood Diamond) leads them on a remarkable journey that forges an everlasting friendship. SAME KIND OF DIFFERENT AS ME shows how a simple act of kindness can change everything. SAME KIND OF DIFFERENT AS ME DVD includes the feature film in standard definition.